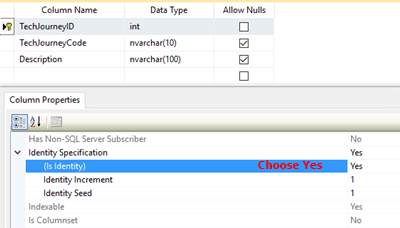 Microsoft SQL Server has built-in an identity column (fields) which used for generating key values. It may refer as an AutoNumber field in Microsoft Access or a sequence in Oracle. An identity property on a column will generate a new value based on the current seed and increment when a new record is inserted into a table. Each new value generated for a particular transaction will different from other concurrent transactions on the table. This identity column can be used as uniqueness column when assigned it’s as primary key. This tutorial will show you how to create a new table using identity property, check current identity value and forcing current identity value to new value. I will assume that you were familiar with SQL Management Studio (SQL Query). Create table using identity property. 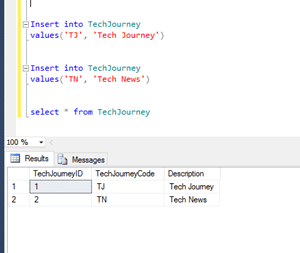 TechJourneyID (identity with primary key), TechJourneyCode and Description. Run the following SQL Statement in SQL Management Studio. 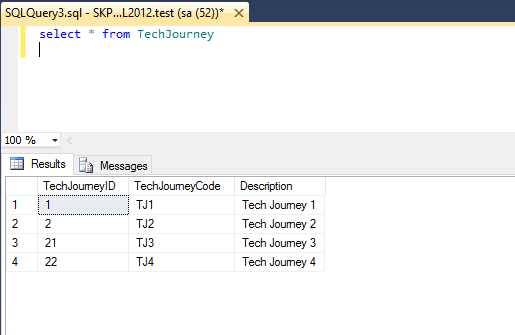 After that, insert two records into table ‘TechJourney’ for us to check the identity values. Note: NORESEED – the current identity value should not be changed. Now we will checking what is the current value after insert two records. Checking identity information: current identity value ‘2’. Forcing current identity value to new value. Now we want to change the current value from 2 to 20. Checking identity information: current identity value ’20’, current column value ‘2’. In the previous step, we already insert two records into the table and the identity value now is 2. 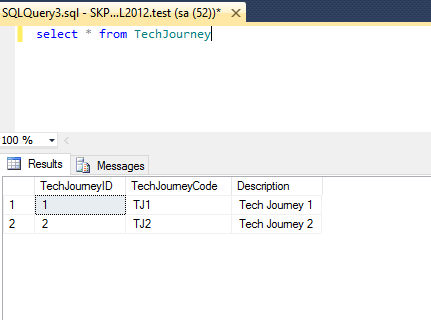 Again, insert two records into table ‘TechJourney’ with the following SQL Statement. The TechjourneyID for ‘TJ3’ is 21 = 20(new idenetity value) + 1(increment)). TS is a computer science graduate from an established university. He is a technology writer for Tech Journey with background in software programming and has been involved in various design, development and implementation of enterprise projects.